The iPad 2 has arrived at stores across the U.S., and so have customers eager to get their hands on Apple’s latest tablet. 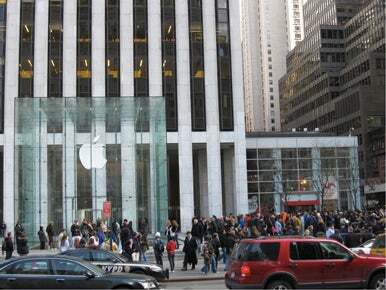 At Apple’s flagship Fifth Avenue store in New York, atrocious overnight weather kept the crowds small initially—two hours before the store opened its doors to iPad 2 customers, the queue in front barely extended out into the street. But as the clock got close to the 5 p.m. local time launch, the crowd grew, with the line stretching down the block and around the corner down Madison Avenue. “It’s been a real fun atmosphere out here, even when we were all freezing and soaking wet in the middle of the night,” said Andrew Christian, a 26-year-old certified pharmacy technician who had been in line since 6 p.m. Thursday. That earned him the 11th spot in line at the Fifth Avenue store, close enough to the front for him to quickly get his hands on a new iPad. 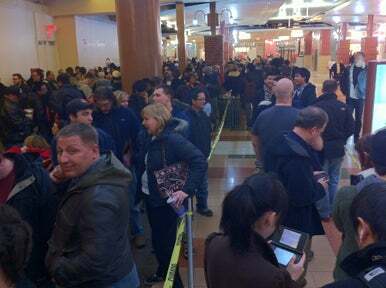 Friday’s queue in New York eventually matched the huge line from April 2010 when the first iPad became available. The thinner, lighter iPad 2 has attracted buyers because of its fast performance and new features such as back- and front-facing cameras. “I knew this second one would have cameras,” said Jay Narang, a New York student who had been standing in line for more than three hours. He was 460th from the front of the line. First place in line at the Fifth Avenue Apple Store cost Hazem Sayed $900—that’s how much he paid to a college student who was offering to sell her spot in line to the highest bidder. But Sayed isn’t complaining—he’s an iOS developer who makes AskLocal, a location-based messaging app that allows you to pose questions to people in your vicinity. While promoting his app was the primary driver for Sayed to pay up for a place in line, he also says he’s drawn to the iPad 2’s support for HDMI output, available with the help of the optional Digital AV Adapter. “Being able to mirror the image on another monitor is really useful because now you can do what Steve Jobs does, which is show people what you’re doing on the screen,” Sayed said. The scene in New York replayed itself at retail outlets throughout the U.S. In Philadelphia, the line outside the Apple Store on Walnut Street started to form around noon; by 5 p.m., it stretched clear around a city block. Apple Store employees ran the length of the queue shortly before the store doors opened, high-fiving patient consumers. Eric Tsurumoto was near the head of the line. “I knew I wanted to get it at the Apple Store, because every launch is kind of an event,” he said. 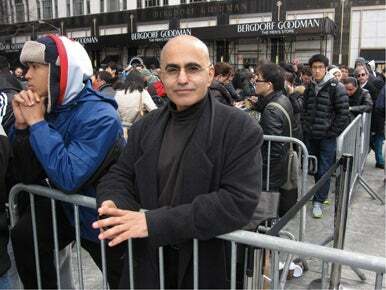 Like many in the queue, he had skipped buying the first iPad and was primed for the newer edition. Carol Hammil, a Drexel University grad student from Egypt, stood next to Tsuromoto. She got in line after seeing that online orders would require her to wait days, or even weeks, for delivery of the iPad 2. “I don’t want to wait that long,” she said. Paul Pezone paid $829 for his original iPad and was able to sell it for $650. “I was an iPad 1 owner and I absolutely loved it, but I’m also a huge gamer. The thought that the graphics are nine times faster [in iPad 2] has huge potential for future gaming apps,” Pezone said. Apple Stores weren’t the only outlets selling the iPad 2 on Friday. The tablet was also available from Best Buy, Target, and Wal-mart as well as from 3G service providers AT&T and Verizon. However, outlets other than Apple Stores seemed to have limited availability in options. At the Best Buy in the Walden Galleria in Buffalo, for example, the store claimed to have 15 tablets on hand, disappointing the crowd of 70 that had lined up in front of that retailer. Fortunately, there’s also an Apple Store in the Walden Galleria, where a crowd of several hundred had gathered. Kimberley Akiko of Buffalo was there to pick up her first iPad. “I am thinking of buying an AT&T model so I can videoconference with my children when I am on the road,” she said. Jorge Gonzalez of Richmond Hill, Ontario, had gotten to the Buffalo Apple Store by 10 a.m. “Still so many people in front of me,” said Gonzalez, who was going to give his Wi-Fi model to his daughter with an eye toward upgrading to a 3G-equipped iPad. Independent resellers were also offering the iPad 2 Friday. A few blocks down the street from the Walnut Street Apple Store in Philadelphia, Mac reseller Springboard Media was offering the iPad 2 to a smaller though still enthusiastic crowd of a few dozen shoppers. James Thomas was in line at Springboard, having sold his first-generation 16GB iPad earlier in the day for $350. “I’m just such an early adopter, a gadget freak, I guess. I liked the first one a lot,” he said, though he does like the fact that the iPad 2 is thinner and lighter. “I’m interested to see what kind of games and applications take advantage of that processor,” Thomas added. The iPad 2 arrives as Apple is facing new competition in the tablet market, most notably from devices running Google’s Android OS. Still, the crowd that descended upon Apple Stores on Friday didn’t seem particularly interested in rival tablets like Motorola’s Xoom. Other stores weren’t as lucky. The Emeryville Apple Store ran out of iPads shortly after 6 p.m. local time. The Chestnut Street store in San Francisco also ran out of stock roughly an hour after opening, and other customers around the country reported similar shortages to Macworld. David Dahlquist reported from New York, Joel Mathis from Philadelphia, and Marco Tabini from Buffalo. Macworld’s Stephanie Kent contributed photos from the San Franciso Apple Store on Stockton Street. Additional report from IDG News Service with Agam Shah and Nick Barber in New York and Boston, respectively, and from PCWorld’s Tom Spring in Boston. Updated at 5:05 p.m. PT with more information from Boston and New York. Updated at 6:27 p.m. PT with information on iPads selling out at Apple Stores.